* This article is part of the original Jobeet Tutorial, created by Fabien Potencier, for Symfony 1.4. Jobeet is an Open-Source job board software which provides you day-by-day tutorials, that will help you learn the latest Web Technolgy, Symfony 2.3.2 (for those who don’t know yet, Symfony is a framework for PHP). Each chapter/day is meant to last about one hour, and will be the occasion to learn Symfony by coding a real website, from start to finish. Every day, new features will be added to the application and we’ll take advantage of this development to introduce you to new Symfony functionalities, as well as good practices in Symfony web development. Today, being your first day, you won’t be writing any code. Instead, you will setup a working development environment. First of all, you need to check that your computer has a friendly working environment for web development. We will use Ubuntu 12.04 LTS Server installed in a VMware Player virtual machine. At a minimum, you need a web server (Apache, for instance), a database engine (MySQL) and PHP 5.3.3 or later. The first thing to do is to prepare a directory on your web server where you want to install the new project. Let’s call it jobeet: /var/www/jobeet. We have a directory prepared, but what to put in it? 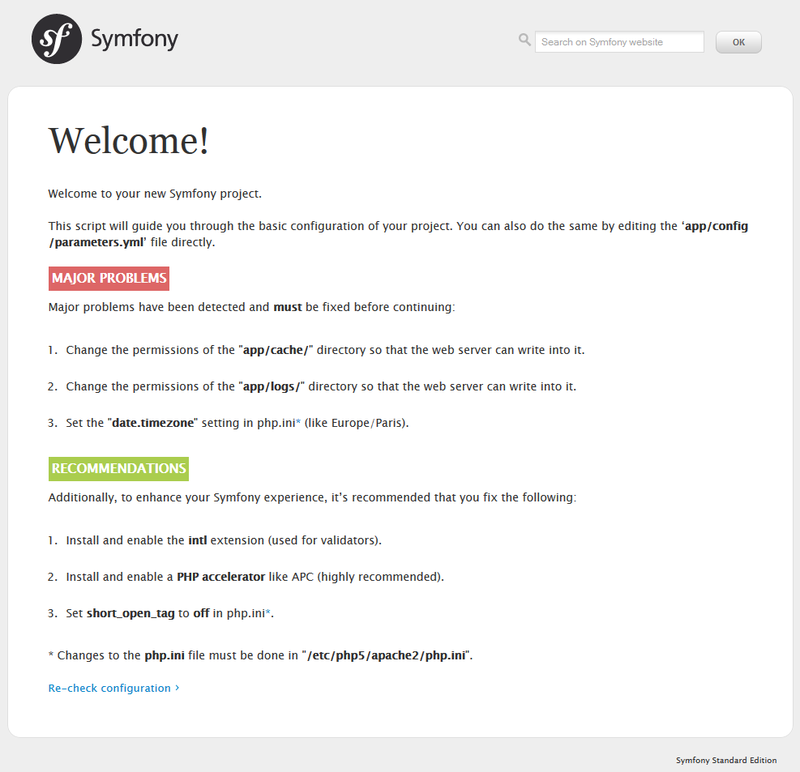 Go to http://symfony.com/download, choose Symfony Standard 2.3.2 without vendors and download it. Now, unzip the files inside the Symfony directory to your prepared directory, jobeet. At this point, you’ve downloaded a fully-functional Symfony project in which you’ll start to develop your own application. A Symfony project depends on a number of external libraries. These are downloaded into the vendor/ directory of your project via a library called Composer. Now, a file named jobeet.local is created. Put the following inside that file, then hit Control – O and Enter to save it, then Control – X to exit the editor. Replace 127.0.0.1 with the ip of your web server machine in case you are working on a remote server. // This check prevents access to debug front controllers that are deployed by accident to production servers. // Feel free to remove this, extend it, or make something more sophisticated. Probably, you will get all kind of requirements when you go to config.php. Below, is a list of things to do for not getting all those “warnings”. Find the date.timezone setting for [date] section and set it to your timezone. After that, erase “;”, placed at the beginning of the line. What exactly is a bundle? Is similar to a plugin in other software, but even better. The key difference is that everything is a bundle in Symfony 2.3.2, including both core framework functionality and the code written for your application. A bundle is a structured set of files within a directory that implement a single feature. Tips: A bundle can live anywhere as long as it can be autoloaded (app/autoload.php). 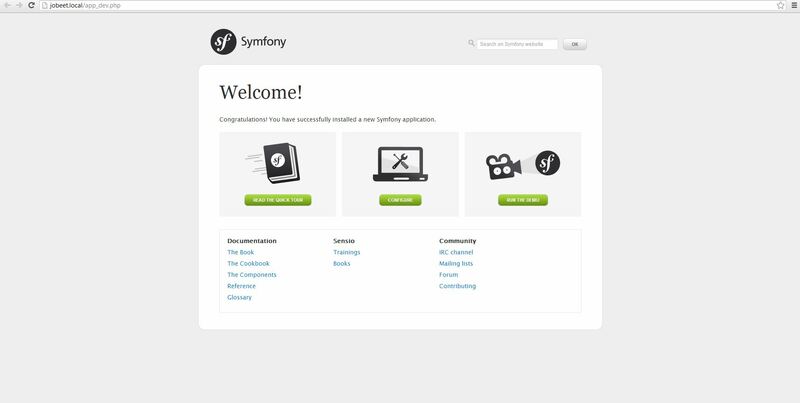 You can read more here: http://symfony.com/doc/current/book/page_creation.html#the-bundle-system – The Bundle System. The new Jobeet bundle can be now found in the src directory of your project: src/Ibw/JobeetBundle. The bundle generator made a DefaultController with an index action. You can access this in your browser: http://jobeet.local/hello/jobeet or http://jobeet.local/app_dev.php/hello/jobeet. The Symfony 2.3.2 Standard Edition comes with a complete demo that lives inside a bundle called AcmeDemoBundle. It is a great boilerplate to refer to while starting a project, but you’ll probably want to eventually remove it. # ... # AcmeDemoBundle routes (to be removed) _acme_demo: resource: "@AcmeDemoBundle/Resources/config/routing.yml"
3. Finally, clear the cache. Symfony 2.3.2 has different environments. If you look in the project’s web directory, you will see two php files: app.php and app_dev.php. These files are called front controllers; all requests to the application are made through them. The app.php file is for production environment and app_dev.php is used by web developers when they work on the application in the development environment. The development environment will prove very handy because it will show you all the errors and warnings and the Web Debug Toolbar – the developer’s best friend. That’s all for today. See you on the next day of this tutorial, when we will talk about what exactly the Jobeet website will be about! Quality content is the key to attract the people to go to see the site, that’s what this site is providing.